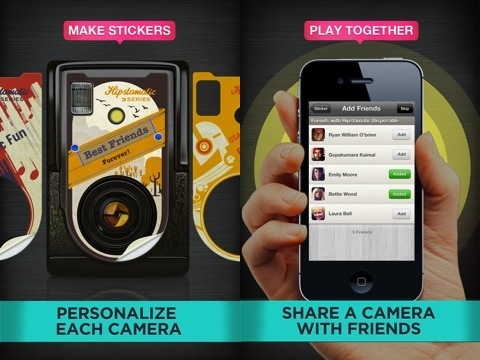 Hipstamatic’s D-Series Disposable Camera app for iPhone gives you and your friends the chance to shoot multiple Hipstamatic photos to the same camera roll. You don’t have to text a photo, and you no longer have to cull through multiple apps or Facebook photo albums for a group of shots. As you gather with friends and family to celebrate and share cherished moments, the D-Series iPhone app’s intention is to capture them with a cohesive, seamless Hipstamatic photography experience. The D- Series Camera app is stocked with two free cameras and another free one accessed by connecting to Facebook. 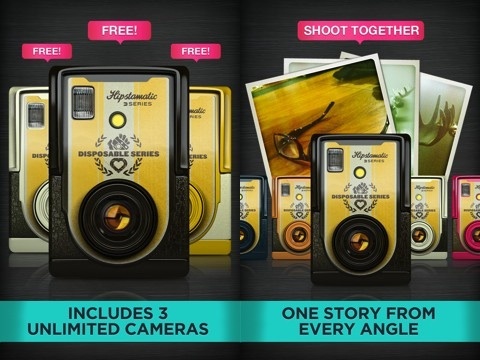 As with Hipstamatic, additional cameras are available for purchase in the app. The interface for shooting your first camera roll is user-friendly and intuitive. You choose your camera. Next, you choose a sticker with the date. There are three colors that have the modern meets vintage aesthetic expected of a Hipstamatic product. The next option is adding friends. This is how you start your group D-Series camera roll. You then start shooting a roll of 24 photos. If you want to shoot more, you certainly can. The D-Series app requires a minimum of 24 photos. You simply adjust the intensity of the filter with a slide across the screen. The process of shooting photos and adjusting filters moves swiftly and easily. When you have completed your D-Series camera roll, it is quickly processed and stamped with the sticker you chose earlier. A screen of thumbnails appears, and you can share the roll to Facebook or email the roll with a touch at the bottom of the screen. When you touch a photo to enlarge it, you can add a comment or stamp it like, dislike, or an icon I’m translating as “cheeky inside joke.” With this functionality, D-Series is creating a social experience within the limited scope of Hipstamatic users you have specifically invited. Like the Pinweel photo sharing iPhone app, you can choose to have a tight control on the people who view and engage with your photography. With so many social networking iPhone apps, the scope of users and engagement is very large, and you have to work hard to contain it with privacy controls. D-Series and Pinweel make it possible for you to manage your privacy and social experience with a user-friendly interface. The D-series iPhone app has great features and a cool perspective, and has potential to gain ground post the Instagram acquisition. But the D-Series iPhone app crashed too often while we tried to review it, and suffers from a diminished rating as a result. Hopefully, an update will be issued soon to resolve this issue. AppSafari review of D-Series by Hipstamatic was written by Jenni Ward on April 10th, 2012 and categorized under App Store, Free, Photos. Page viewed 4348 times, 3 so far today. Need help on using these apps? Please read the Help Page.